Qualified health care professionals are in demand and the first step to entering the field is an online degree for LPNs. Whether the degree is a stepping stone for further education or where you want to grow your career, you can find flexible and quality opportunities at a wide range of schools. First, you need to do your research to ensure the program you choose meets the licensure requirements in your state. 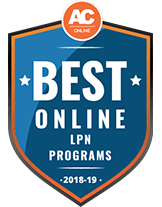 We’ve done some of that work for you, looking at a variety of services and features to bring you a list of the best online LPN programs for 2018.